Coral Medical Health Spa is very pleased to provide the First Line Therapy (FLT) Program, a comprehensive program that can help you address unwanted weight gain and lifestyle related health complaints such as high cholesterol, high blood pressure, type 2 diabetes/cardiometabolic syndrome and insulin resistance, chronic pain and other conditions related to aging. The First Line Therapy Program is based on clinically effective means of promoting healthy body composition while maintaining muscle mass. The ability to achieve this is one of the best signs of healthy aging. Coral’s team of health professionals, which include Dr. Zoia Sherman, have developed different FLT packages to suit the clients individual needs. All plans include clinical nutrition, menu planning, stress counseling/treatment and bioelectric impedance analysis (BIA) testing. BIA analysis provides information on your body composition including fat mass, lean body mass, cellular hydration, phase angle, basal metabolic rate and BMI. Coral’s nurse practitioner then provides you with an individualized program to address your unique needs. In addition to FLT we often recommend a nutritional supplementation protocol to assist with treatment. *All information on this page can be found at www.metagenics.com. 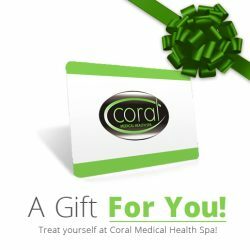 Please contact Coral Medical Health Spa to schedule your initial consultation or to learn more about this exciting program.